Install your side panels. 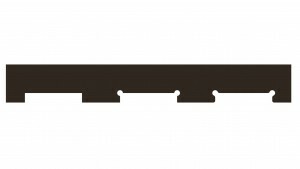 Lightly hold or clamp a panel in place and center-punch on the steel chassis tab. 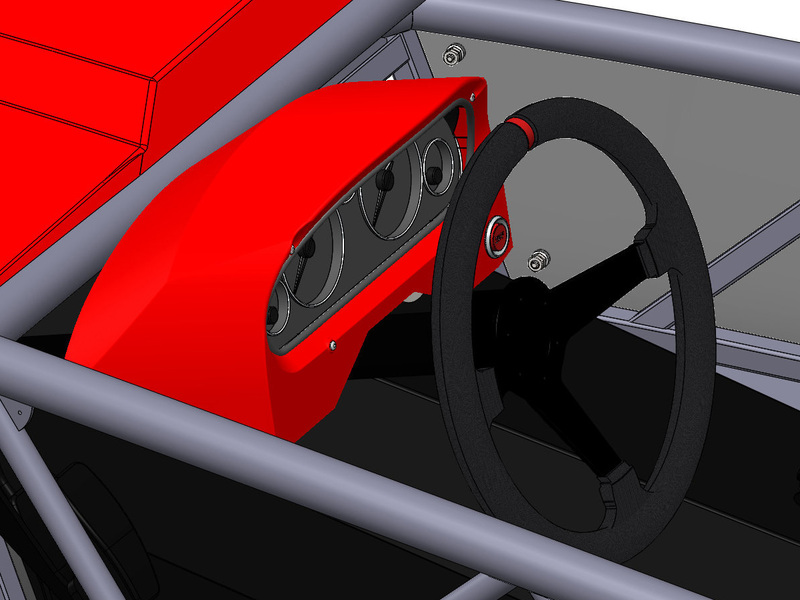 The curved end on the panel is the rear. The front of the panel lines up just behind the front of the tube. The idea is for the tube to take rock impacts before the panel. Adding trim to the leading edge of the panel is a good idea. Put the grommets in the acrylic holes. Bolt head on outside, then supplied gasket, then nut, then frame tab, then another nut. Install your mounts first. They are riveted in. We used hardware store rubber grommets (1/4″ ID) to protect the bodywork from the hardware. Next is positioning the bodywork on the mounts. The hood does not sit on the tubes – it stands off a little to prevent scratches and increase airflow. 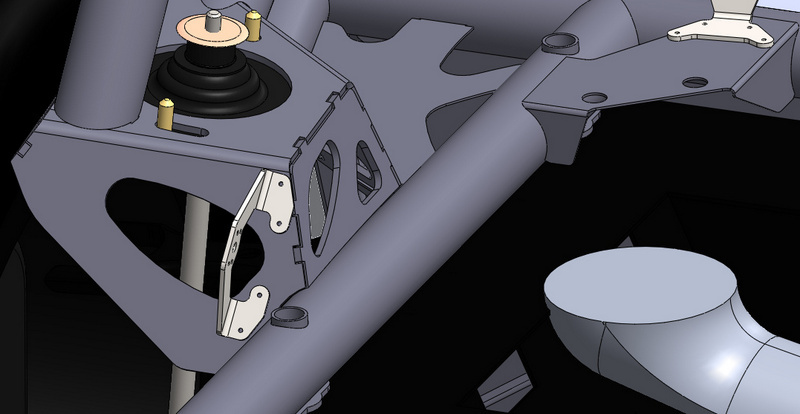 The hood is also positioned forward on the main round 1.75″ OD “dash” tube. You want to place the hood just back enough to overlap the front of the tube from the top view. We recommend using trim to cover the edges, but it is not required. The front hood mounts are shorter than most customers will mount their hood. Theoretically, a 1.6 hood could be mounted that low, but you’ll need to space it if using a later NA or NB (intake manifold and idle adjuster screw). 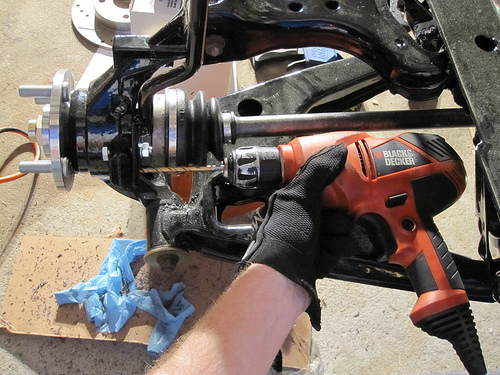 We used 1/4″-20 button head screws for maximum adjustability. You can use two jam nuts to hold them in place or hardware-store clip nuts like we did. We used a hardware store rubber spacer with a washer on top for the hood to sit on. 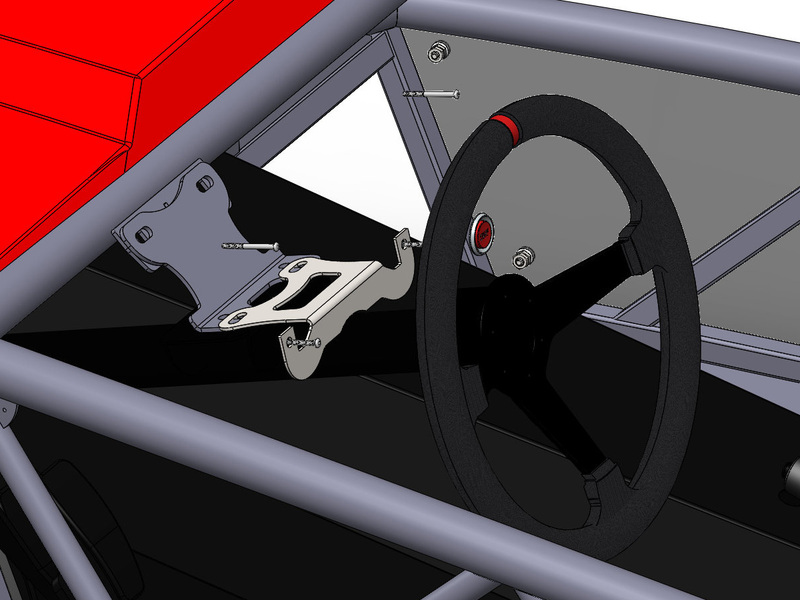 The bodywork mounts are also designed to use Dzus or quarter-turn fasteners if you wish to go that route. 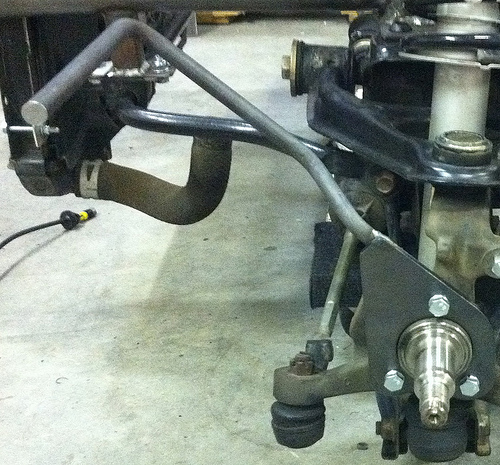 The front and rear bodywork mounts are pre-lased for 5/8″ and 3/4″ spring fasteners if you want to go that route. Mount the nose after the hood, and be sure the hood is pushed all the way back on the aerocatches (they have a little slop). To mark the holes for the bodywork fasteners, we used a little bit of grease on the center of each mount and tapped the bodywork against the grease when positioned correctly. The grease marks your pilot hole, which you can drill normally. Drill your final hole with a sharp undamaged drill bit and tape the gelcoat to reduce chipping. Different radiators will have different heights and mounting positions. Place some painters tape along the bottom of the nose. Mark out your cut lines in pencil, then go over with a sharpie. To prevent future fatigue cracks, drill holes at the intersections. A 3/8″ drill bit will work nicely. Just to further explain the stress relief holes, I made a quick drawing. The left drawing is what you want to avoid. The middle one is perfectly acceptable and will last a long time. Be sure to drill the holes first, as it is quite difficult to drill anything but a full hole in something. The right one just simply looks a little better and more finished. You can accomplish the rounding by placing some 80-180 grit sandpaper on a thin, hard block of material. Even a ruler would work. Sand before you take off the tape, and be careful not to scratch the gelcoat. It’s good practice, as, this is a part of the car that will hopefully never see the light of day. You can then cut the fiberglass with a metal blade. Do not use a wood blade, as you want a high tooth density to resist the chance of cracking the gelcoat. Hand saws, hack saws, jig saws, dremels, angle grinders with cutoff wheels, and pneumatic cutoff wheels all work great. When you cut the fiberglass, wear some latex gloves and a dust mask. If you’re heating the fiberglass with your cutting tool (rotary cutoff wheels), wear a respirator. Before you take your gloves and mask off, take off the protective tape. Wet a disposable cloth and wipe down the nose to clean up the fiberglass dust. Do not use a paper towel, paper towels will scratch paint and gelcoat. Fiberglass dust can be itchy, if you get some on your wrists or anywhere else, rinse the area in cold water. If you got some in skin folds (like inside your elbow or between your fingers), press duct tape on the affected area and pull it off. It will get the fibers out. Now for the trunk. Put some painter’s tape on the 1.75″ OD round tube (rear cabin bulkhead) in front of the front subframe, as you’ll be marking it. You’ll want to set the trunk cover on the car. With painter’s tape and a sharpie, mark when the front of the trunk intersects the tube. 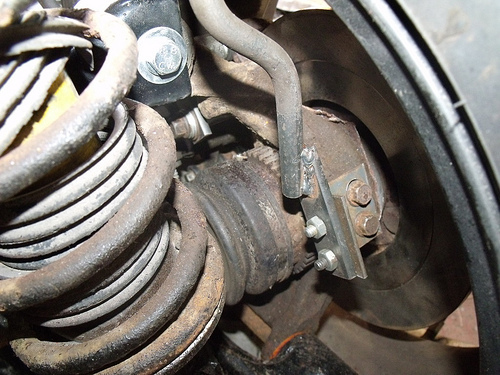 This will tell you the longitudinal position of your front trunk mounts. This sets the relationship between the trunk and the rear tophat mounts. There should be a 1/4″ gap on that rear tophat. 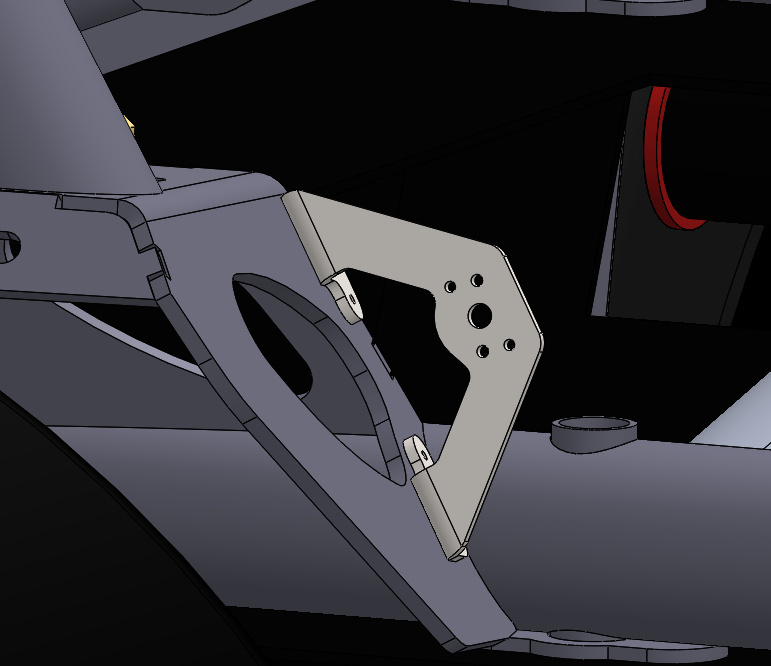 The front trunk mounts do have an edge that lines up with the fuel tank mounts. 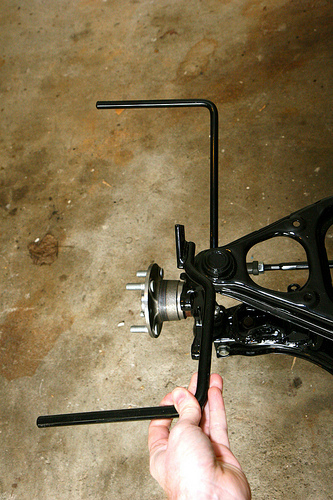 The rear trunk mounts are fixed and you can install them as shown in the pictures. The bottom of the mount should be no closer than 0.25″ from the rear tube. The edge on the mount that lines up with the inside of the tophat is intentional. That’s how you determine the angle. Height is not critical, as long as it’s the same on both sides. We put ours right under the radius of the tophat’s sheet metal bend. After mounting the front nose/hood piece, the trunk should be fairly self-explanatory. Grease or shoe polish on the mounts, slip on the trunk, tap against the mounts, drill your pilot holes, drill your final holes, and done. 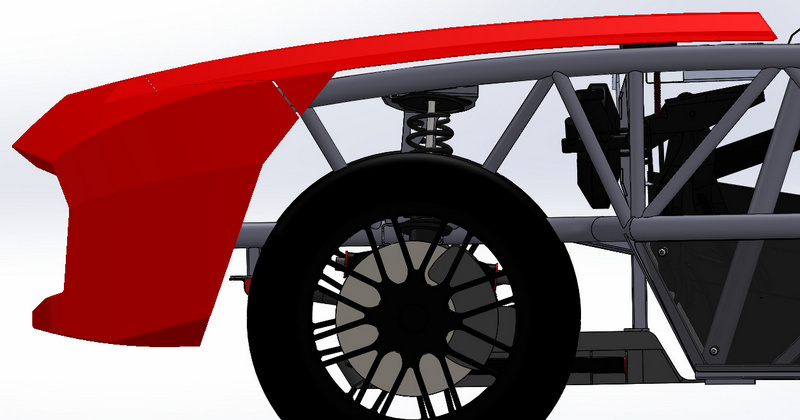 The Exocet kit includes eight fender mounts. 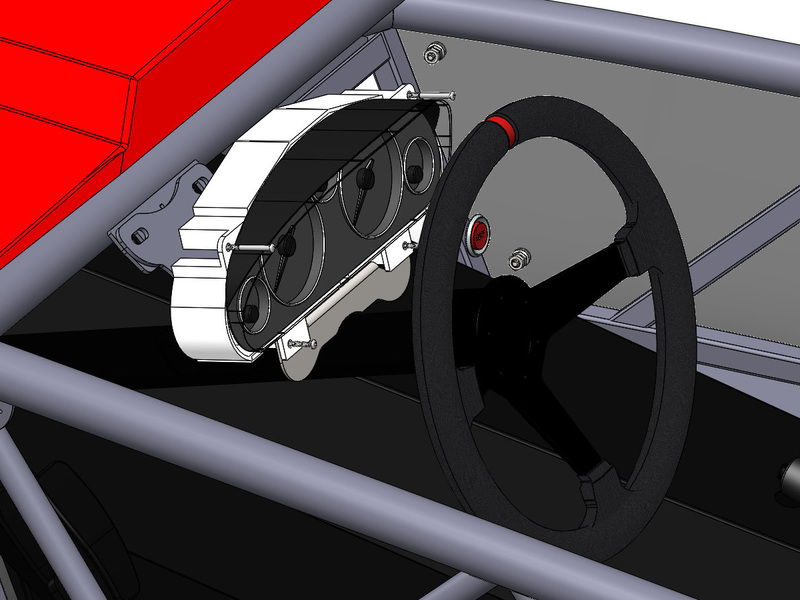 Two fender mounts are used in each corner. Once installed, the fiberglass fenders can be mounted by drilling appropriate holes and using polyurethane adhesive to bond them to the fender mounts. 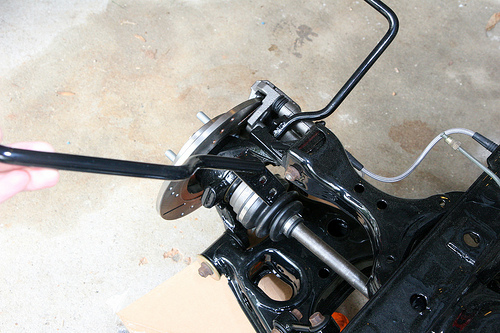 The frontmost fender mount is the one with three bolt holes that replaces the stock brake dust shield. The fender mounts that go on the back of the front corner and the front of the back corner are the same size/design and will bolt to the top caliper bolt. 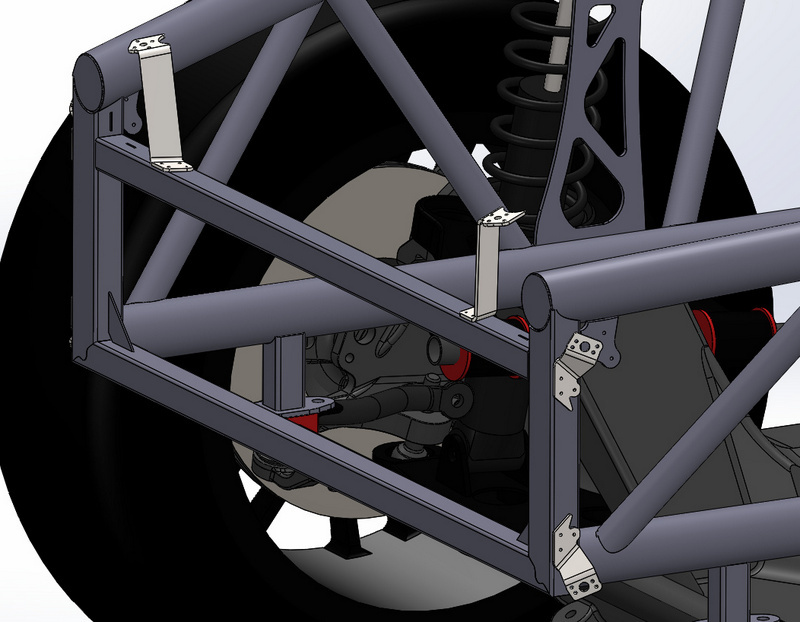 The rearmost fender mount is the one with the slightly longer mounting tab, meat to bolt to the nub on the non-ABS rear upright. Note 1: Depending on the castings of the Mazda uprights and where you drill your hole in the fender mounting tab, you may need to take an angle grinder and remove a little material from the mounting tab on the fender mount for proper/secure fit. 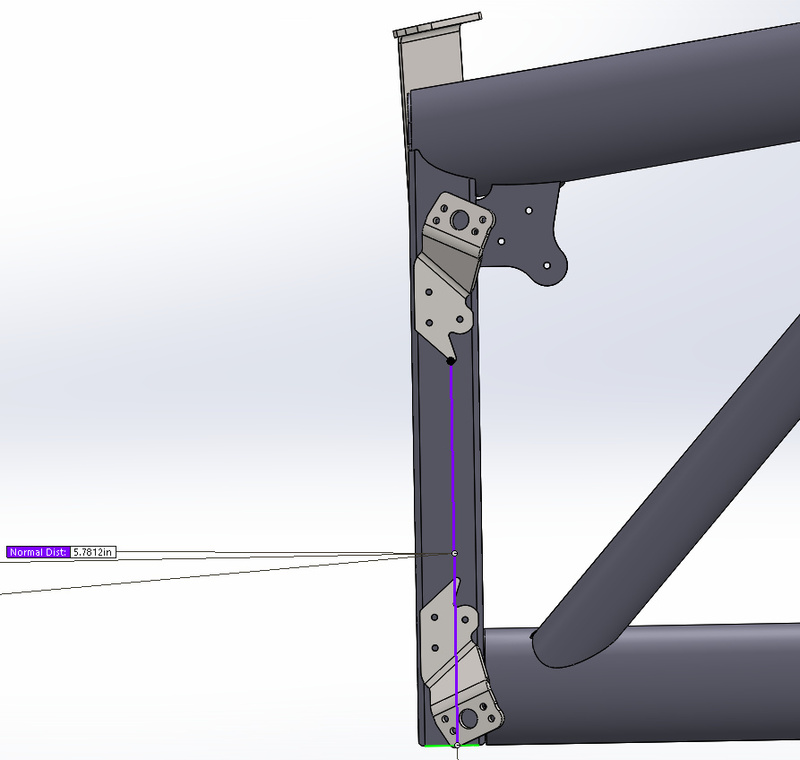 Note 2: The fender mounts are made out of 1/2″ steel bar and are designed to have enough give to be bent a few degrees as needed for final fitting of the fenders. Once bolted down, you can bend them with your hands with a sizable amount of force. Note 3: You may want to use a little thread locker on bolts, especially the top caliper bolts. 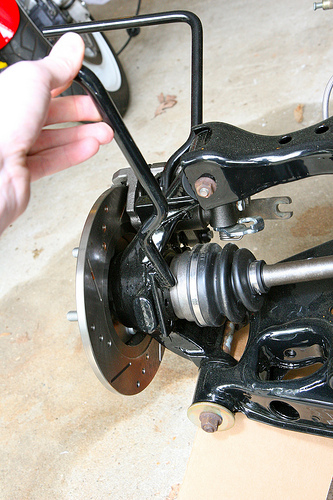 Note 4: In rare cases, some Miata donors may not have a nub on the rear upright and will require a steel angle bracket to be attached to the upright. Remove dust shield and replace with bolt on mount. Locking washers are recommended. 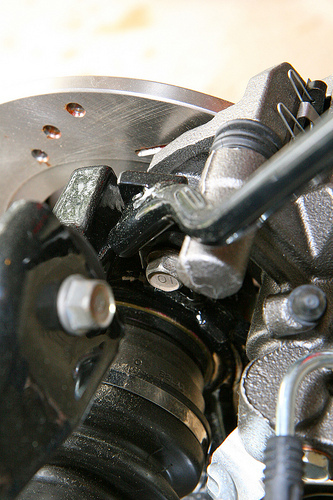 Note the angle and where it fits to be bolted via top caliper bolt. Drill two holes and use bolts with locking washers and/or nylock nuts to secure to the nub in the rear hub. Note 1: You may want to consider grinding or filing the side of the nub flat for a better fit. 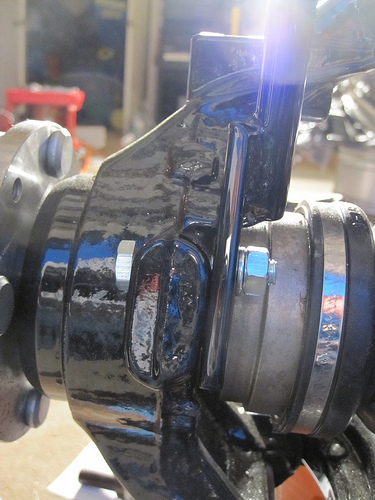 There have been a number of ways builders have approached securing the fiberglass fenders to the steel mounts. The basic concept involves cutting a hole for the 1/2″ diameter bar to support the fender and then securing the bar to the underside of the fiberglass with polyurethane adhesive, P-clips, or welding a small tab to the fender mounts for a larger attachment point. This is the classic method first recommended by MEV on the first UK Exocets. Exomotive used this method on XP-1 and we have now had it running for over 3 years on the street and track with fantastic results. This method involves roughing up the surface on the bottom side of the fender to ensure a good bond. We recommend using the highest quality polyurethane adhesives from manufacturers like Loctite, DAP, Liquid Nails, and others. A 10oz tube will cost between $7-15 depending on brand/purchase location. Use a healthy amount of PU adhesive to completely surround the entire 1/2″ bar and continue at least an inch in all directions on the underside of the fiberglass. 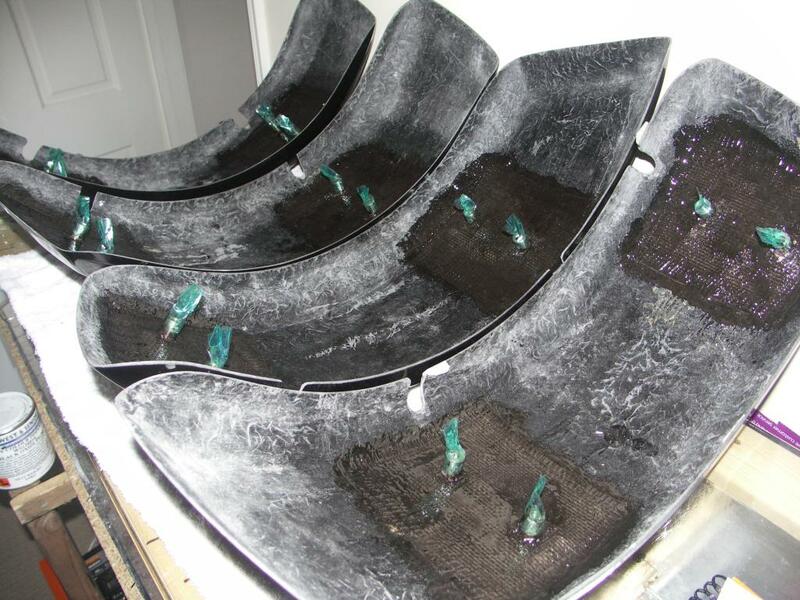 After application and setting the final position, place a microfiber towel on top of the fender and place a few books or weighted items on top to keep slight pressure during the curing process. 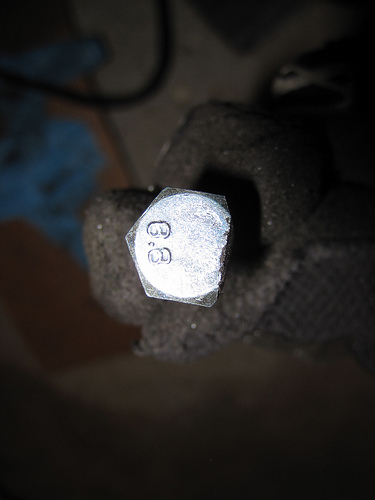 Builder Geoff (Steadfast) used these 1/2″ P-clips to grip the bar then used allen-head bolts, metal washers with a rubber washer on the side that contacts the fiberglass, and nylon lock nuts to prevent loosening. Similar to the P-Clip method, this method involves welding a small tab to the 1/2″ bar to provide a place to bolt the fenders on. 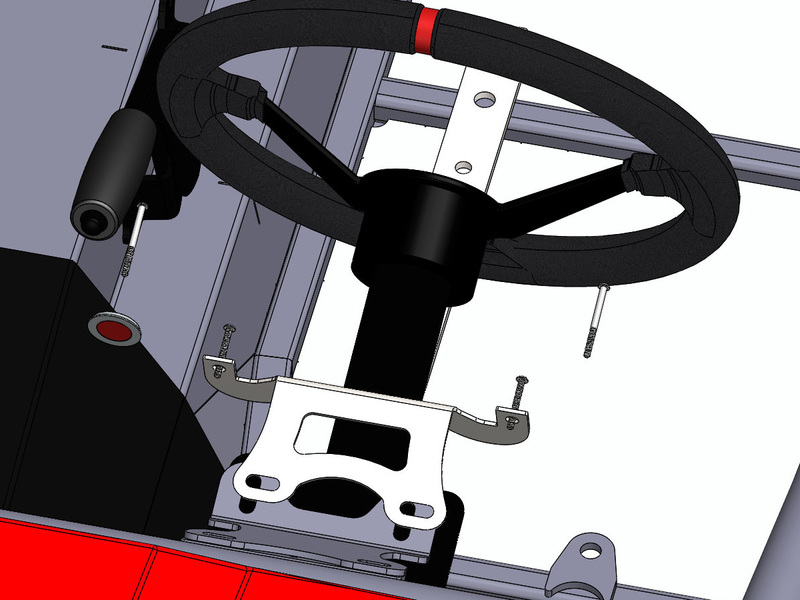 If your desire is to be able to run a number of different tire/wheel/offsets, you could consider adding a slot in this mount to allow the fender positions to slide and be set with bolts in the optimal position for the wheel/tire/offset combination selected. UK Builder JGilbert took this method a step further and fiberglassed small stainless steel plates into the underside of the fenders. Read more on page 21 of his build thread.